He is dancing, hopping, romancing, popping, and better still, working in the fields. In tow is a pretty lissome beauty, either a firang in a flashy, revealing dress or a suit-clad beautiful model looking every inch Punjabi. This is primarily how we see pairings in any Punjabi music video. In fact, now you would see more of Australian, Russian and Canadian beauties as lead models in a song, gyrating to anything that the singer is singing. Now, here is the twist: Punjabi singers are now pairing up with lead actresses and Indian models for their music videos. Sunny Leone sizzled with Punjabi singer Girik Aman in his track, Saari Waali Girl. Up next, the leading lady of Punjabi films, Neeru Bajwa will be seen in Jassi Gill's next track, Vich Pardesan. The track will be released by Speed Records and has been shot by Virsa Arts. That's not all — Rahat Fateh Ali Khan's new track, Zaroori Tha, features reel-to-real-life couple Gauhar Khan and Kushal Tandon. While some Bollywood actresses had marched into the Punjabi film industry a few years ago, swanky music videos seem like their go-to mantra now. Is it just the need of the hour or an emerging trend? From starting off with damsels from Chandigarh and Punjab, Punjabi music videos have now progressed to a bevy of international models. Gippy Grewal, Diljit Dosanjh, Kamal Heer and Malkit Singh are some singers who’ve had pretty international faces light up their screen. Actor Kartar Cheema, who has modelled in over 100 music videos, says, "There was a time when singers would hire male and female models as per their requirements. Now, since the singer himself acts as the model for the video, male models seem to be running out of business." Kartar, however, goes on to add that this trend is emerging for the good. "A singer has the right to come on screen, so that people know the face attached to the voice," he says. But, as far as female models go, singer-actor Nishawn Bhullar, who leaves the choice of models to his video director, feels it all depends on the track. "Since a lot of music videos are shot overseas these days, we prefer hiring local models," says Bhullar. 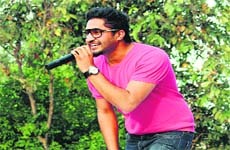 Singers like Yo Yo Honey Singh bring famous faces in their videos; other singers sure are taking a clue from it. Singer-actor Jassi Gill is one of the first new-age personalities who have roped in leading actress Neeru Bajwa for a music video. The video has been shot at Nalagarh and is a sad, romantic song based on the life of a gangster. Jassi, who is visibly excited about this, gives Neeru Bajwa and his team of Virsa Arts due credit. "We all know that Neeru Bajwa does Punjabi films, but when she listened to the track, she immediately said yes," says Jassi. The track will appear in his next album On Speed Records, Replay-The Return Of Melody. "Neeru is a thorough professional and so was everyone on board—Desi Routz, Navjit Buttar, Arvinder Khaira, Enn Syan and Varinderpal Bains. This lends a professional touch to the video." Another Punjabi singer who can't stop talking about Sunny Leone's first Punjabi music video is Girik Aman. "We work really hard on our tracks and we would want the model or the lead actresses of our video to be the best too!" says Girik. He's changed what and the way young India reads. If imitation was the best form of flattery, he would certainly walk away with most flattered award as he has spawned not only host of clones but almost a production line of stories set in IITs and IIMs. Chetan Bhagat, the million copy writer, has several reasons to be kicked and keep his readers kicking. But right now it's the flick Kick that ought to give him the adrenaline rush. Nah, the blockbuster that is all set to enter the ~200 crore club, is not based on one of his books. But the author with the Midas Touch has certainly embellished it with his writing prowess. As Kick's screenplay has flown from his pen, he recalls how his affair with cinema that began as a fling is now a relationship in which he can't afford to fail. Failing anyway is not an option this immensely successful writer of books like Five Point Someone, One Night @ the Call Center, The 3 Mistakes of My Life and 2 States would ever consider. If his books have ensured his place under the sun, their adaptation into films have further entrenched his celebrity author status. Over to the investment banker-turned-novelist, who happens to be also an eloquent motivational speaker. Screen shot: Writing a screenplay is more of a collaborative effort, more concise and precise. However, your reputation is certainly on the line. And when you have a superstar like Salman Khan in the film and expectations of the film raking in hundreds of crores riding high, you dare not go wrong. Better that the best: Out of all my books adapted on silver screen Kai Po Che is without doubt my favourite. It's exceptionally well made and not only because I wrote the screenplay. Pulse of youth: How do I get it right? By being with them. I am a people's person, not an island unto myself. Gen Y: No generation is ever perfect, nor is this one. It's confused as well as connected, skilled yet consumerist. Like all generations, it's a mixed bag. Sharing his love story: I was okay with it. I did fictionalise 2 States. Besides, I didn't know it would become so big, neither the book nor the film. Why the book not only sold a million copies but had admirers like this Sikh gentleman. It was Chetan's book that made him agree to his daughter's cross cultural marriage. And guess what? He put up a stall of the book at the wedding ceremony! His alma mater: Have I wasted my degrees by not pursuing a job? But considering how my books have immortalised both IITs and IIMs, I don't think I have done a dis-service to them. JK Rowling of India: Or, Rakhi Sawant or Ekta Kapoor of books I have been called many names. I am just me. We all are unique with our own USPs. What it takes to be a writer: There is no one quality. But one must know how to articulate one's thoughts and be clear and lucid. Lending voice to Tata Sky education project: It's better than selling deodorants. I can identify with the concept for my children are the same age. Easygoing father: I may not be the best father but I am a friendly one who likes to spend time with my children. Fame is a sword: Not just double-edged but triple- edged and can take you in many directions. Anything you say and people are only too eager to slam you. Not all criticism is bad. I take actionable criticism seriously and try to change accordingly. Atypical man: What to talk of typical Indian, I am not even a typical man. I think differently. Crimes against women would lessen if men paid heed to their feminine side. Down the lane: I would not like to be remembered, only missed. It was love at first sight; Aashish Thapa knew she was his. It was 2011 and he knew he would do everything physically possible to get her. He couldn't get her out of his mind. And finally, the day came; butterflies in his belly, Aashish went and got her home. Together, they have experienced many ups and downs of life — he and his Royal Enfield Continental GT are soul mates. As Aashish shows her off to us, he mentions the amazing feat his bike has helped him achieve. Aashish is the first person in the world to take a café racer bike by Royal Enfield to the highest motorable road, Khardung La — 18, 380 ft above sea level. "I knew only she could do this. When I saw this bike at the Auto Expo in Delhi, I knew in my mind that I was going to be the first one to own it," says Aashish, who works as a sales and marketing executive with Harley Davidson, Elante Mall, Chandigarh. More than an achievement, this is an experience Aashish still carries fresh in his heart and mind. "I didn't go out to make a record; in fact, till the time I posted my picture with the bike at the pass and till the time I got a call from the Royal Enfield group — informing me that I was the first person to take the bike there — I didn't even know I had made a record," he says, with all modesty. Aashish was just hitting the road for an experience. He is a biker who owns three bikes and likes to take his machines out for a ride in the sun and rain whenever he can. "I wanted to see how this café racer bike behaved. The handles of this bike are a little far and long, so a biker has to bend slightly, which creates a somewhat awkward position. But once I'm on the road, I don't have to bother about anything. She is at her finest best; I do stop at the end of the day to check on her, but she's always in perfect shape," shares the biker, who took a 10-day trip down to Leh, covering 3,400 kms on the bike. As for getting his name published in record books, Aashish says, "I approached people at the Limca Book of Records but they said they would've registered my name only if I had completed the journey in 3 or 4 days. But, as long as I have her by my side, I have a long way to go!" Wading through physical clutter to find what we need drains our energy as well as time. Drained energy adds up to additional strain and ultimately additional stress. The first week of August is celebrated as the 'Simplify Your Life Week'. Let us just keep moving on with the concept and try to find ways of simplifying our lives in a way that minimises the stress in our lives. Simplifying our lives means cutting on the toll that clutter takes on our minds and bodies. Planning the next move in a state of mental clutter can be pretty unnerving. We must be sure of what our resources are. Otherwise, we can be extremely overwhelmed by our environment. Needing to prioritise can be very overwhelming, if we are not very clear about what we want. Trying to consciously find conditions where we need to relax actually triggers the stress response. When our fight-or-flight response is triggered, the psychological response of clutter becomes physical in many ways. We then become less able to make decisions. This can create additional problems. Resources for simplifying: Simplifying life in ordinary language would mean taking a big step towards a less stressed life. Making simple changes in your day to day life would bring significant changes in the form of results in the future. Voluntary simplicity: This concept has been gaining popularity since the '90s, because a lot of people have been feeling the same way. Finding simple ways of reducing stress and at the same time maintaining the activities that are important to you is the key. Streamline your life: One of the best ways to simplify life is to create systems that take care of themselves. You need to just simplify your mind. n	Mindfulness: This is a type of meditation that can be practiced anywhere and it helps you get rid of your mental clutter if practiced with concentration correctly. Maintain a diary: Make a note of all the activities you need to perform the very next day and consult your diary whenever required. Prioritise: Work a schedule according to what you feel is important for you. Cut down on unnecessary commitments and stick to things that are more important to you. Small changes: Try and make small changes in your lifestyle habits which are bothersome to you. Remember, slow and steady wins the race. n	Let go of negative relationships: We spend so much time carrying unnecessary baggage. Very often, we don't have strong defenses against negative people just because they are nice to us. Take an honest look at your relationships and save the drama in your life. Learning to say 'No': This is a very important part of simplifying life. More often than not, because of our polite ways, we accumulate stress. Live within your means: Living by your neighbors' standards is a sure-shot ticket to unhappiness. Find time of hobbies: Within your busy schedule, find time for hobbies like sports, painting, walking etc. Simple activities that give you simple happiness. Manage time: Say no to time-demanding activities that do not serve you in any way. Keep it simple: With demands from work, school and life in general we tend to overstretch ourselves. Always rushing through life can be exhausting. 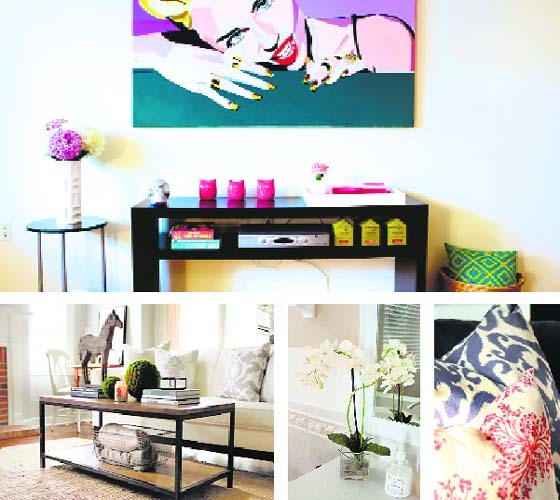 Injecting ones personality into a home is what decorating with accessories is all about. It's one of my favourite parts of the process. But, for others, selection and placement of accessories can become a rather perplexing and overwhelming experience. A simple rule to remember is that 'the eye has to travel', you have to create areas of interest. Within this vast umbrella term, accessories, let's see what we have and how to best use them. What is important is not how valuable or inexpensive your objects are, but how you arrange them. Perfectly balanced interiors can look bland and monotonous. Experiment with asymmetry by using an odd number of the same items. Coffee tables need to be decorated too, but in our culture, where hospitality and food rules, it's not always possible. Most of us prefer to leave them blank. One solution is to go for the largest table possible so that even when not in use, a part of it will always look pretty. Create a family-and-friends wall on the staircase or landing. Pack it with closely-hung frames of different sizes and up to three finishes (eg black lacquer, chrome and oak). To chic it up, black-and-white photos are neat and make everyone look better. Never place a cushion on an angle on a sofa; it's so '90s! Do fluff them up and give them a karate chop in the middle. For that boutique-hotel look, place a pair in front of your pillows on the bed. First you must determine what you want the rug for - is it a focal point? Or do you want to group furniture on it? Secondly, you must measure what size rug you need before you go shopping. They help soften wooden or hard floors and add contrasting colours and patterns into the room. Placing plants throughout your home helps add natural colour, texture and also softens the area making it more appealing to spend time there. Don't forget to use attractive plant pots and containers for your plants. If you can't care for house plants then go with fresh flowers. Keep them elegant by sticking to one colour. Fresh flowers are easy to blend in with any rooms' accent and you can swap and change the colour, type and position at any time. They are such an easy and adaptable accessory to have. If you are allergic to flowers, try artificial flowers instead. Cheap candles and oil diffusers smell cheap. Indulge in a decent fragrance for a subtle perfume and soft light. Do not overdo it. A room lined in books can be a delight. Stick to hardbacks or neat vintage paperback collections. Your selection should reflect your passions, so much so that you might pick them up to look at once in a while. No coffee table should be without your favorite glossy non-fiction hardbacks stacked horizontally in diminishing sizes. Mirrors are available in a plethora of shapes and sizes these days. Not only do they add beauty, but also help create the illusion of space. By cleverly placing mirrors on an opposite wall to something that is interesting in your room, it will reflect the image and add a sense of space. For darker rooms, hang a decorative mirror near a window. The light will bounce off the mirror into the room portraying more natural much-needed light back into the area. To give the illusion of depth in a room paint one of your walls in a darker contrasting colour to your other walls. Then, hang a mirror on that darker wall. This instantly gives the additional sense of depth to the dimensions of the room. Light fittings are one of the most important elements of home decor accessories, as they set the ambience of the room. By using different types of lighting, you can create different moods on different areas of the room, at different times of the day. Accent lighting such as a spot light is used to emphasise wall paintings, ornaments or other interesting areas in a room; soft lighting used by small wall light fittings, table and floor lamps, help create a gentle romantic mood; general lighting such as a ceiling centre light, strip light or bright wall lamps are used for general lighting. Home decor accessories are the ultimate icing on the cake for any interior design project and play a crucial part in your home decorating. Remember to take necessary dimensions before shopping and don't over indulge just because it's pocket friendly - take your time, shop around. But, more importantly, don't follow trends so closely; instead, follow your heart and let your personality flood your home. Not only does art add charm to a room, it absorbs noise and can actually help change the illusion of a room's shape if placed correctly. For example: horizontal landscape pictures help widen a room; portrait floral pictures help give the illusion of height; and one large picture reflected through a mirror gives the sensation of additional broader space. To help balance out a large space and give a window effect in a small space, hang smaller pictures in a cluster. For larger pictures, place them in proportion to the furniture. For example, hang a large picture approximately six to nine inches above a sofa or at eye level. A facial mask is one of the oldest aesthetic methods to condition the skin and give it a boost for a more youthful as well as radiant appearance. However, always consider your skin type before using any type of facial mask, as you can inadvertently irritate your skin if you don't take this into account. When it comes to facial masks, you have many options but before using it the important things to consider are the ingredients of the facial mask, your skin type, how the mask will work to address your specific problems and whether you might suffer from any side effects. Always keep in mind that before using any type of facial mask, it's important to try it out on a small patch of skin, especially if you have very sensitive skin. The human skin is designed to react very quickly to anything it perceives as a threat, so if you're trying a new facial mask for the first time, and your skin has never come in contact with the ingredients before, it can react in a defensive way, by giving you an allergic reaction. The fact is that most facial masks are not that well customised to individual skin types, so there is always a danger that introducing a new ingredient (and massaging it into the skin) could backfire. No matter which facial mask you choose, be sure to read the labelled ingredients and select one that is free of artificial fillers and parabens. If you are diabetic or on blood thinners, consult your dermatologist before using a facial mask to avoid any adverse effects. If you experience severe redness, itching or swelling with the facial mask seek medical assistance immediately, as any allergy has the potential to become fatal. Also delay the application of facial mask if you had a recent attack of Herpes virus infection or severe acne. Irreversible darkening, pigmentation of skin, contact dermatitis are a few of many adverse reactions that can occur due to wrong choice or usage of a facial mask. The modern-day facial mask isn't just about being pampered, but about nurturing the skin with the right ingredients. That's why, if you want to choose the best facial mask, you need to understand how they work. Facial masks are available in these basic formulations: wax-based, vinyl or rubber-based, hydrocolloid and earth-based. Wax-based face masks are most frequently recommended for individuals with dry skin, owing to their ability to temporarily impede trans-epidermal water loss. Peel-off facial masks have a waxy texture. After they are applied to the skin, peel off masks should be given sometime to dry until the entire layer is consistent. Remember, peel off facial masks should be removed very slowly, so as not to cause inadvertent damage to the skin. These masks are generally left in contact with the skin for 10 to 30 minutes and then removed in one sheet by loosening at the edges. They are marketed in the form of dry ingredients in a sealed pouch that must be mixed with warm water prior to application. The resulting paste is then smeared over the face and allowed to dry. Earth-based masks are formulated of absorbent clay. The clay produces an astringent effect on the skin, making this mask more appropriate for those with oily-skin. When using this type of mask, it's a good idea to let it dry out on top of your skin and then gently rub it off with warm water. There are also so-called collagen masks, which are meant to boost the amount of collagen in the skin. Now, the thing to keep in mind is that collagen molecules are too big to be absorbed by the skin, so if a collagen mask simply contains this ingredient, it may not be fully beneficial to you. That's why you want to focus on getting the kind of facial mask that contains ingredients that stimulate collagen production. While shooting for a movie being made on 1984 riots in a Ludhiana village, actor Dayashankar Pandey is saddened to see the parents staying all alone in large houses. "The children have gone abroad to earn money so that they can repay the loans of the families, but once they are settled there, they cannot return because of the aspiration of their next generation. So, there is longing and grief on both sides," he says. He was in Ludhiana to perform in a play Bhamashah ki Gatha. He is an actor not by accident, but by intent and destiny. He says. "I think whatever the Providence intends one to do, one is blessed with such talent and qualities. My family had nothing to do with the world of acting. But it was my will to be an actor, that I am in this industry," says Pandey. In his family, there used to be a tradition of sporting a moustache, back then, and it used to be shaved off only after the demise of the head of the family as a mark of mourning. But he got it removed on the suggestion of director Chandraprakash Dwivedi, enduring and braving the displeasure of member of his family. Pandey has been a part of a number of landmark movies, including Lagaan, Swades, Rajneeti, and played cameos in several others. He has also been active in theatre and television. "I think I have been lucky to be a part of such movies. Whenever the names of such movies would be taken, my name would also be mentioned," he says. Currently doing movies with quirky names like Mohalla 80 Ka, Hum Jab Baithe Teen Yaar and Patel ki Shadi Punjab Se, he says that success of off-beat movies augurs well for actors like him, who are able to showcase their talent. "Commercial cinema is also very important for this kind of cinema to thrive. Shah Rukh Khan and Salman Khan bring in the money in the industry which also helps supporting art and off-beat cinema," he says. He has been playing the role of Chaloo Pandey in Tarak Mehta ka Oolta Chashma and Shani Dev. "I think Shani Dev was one of the more challenging roles I have ever attempted. It was a completely new character. It is easier to play divine and mythological characters that people already know about, but this was never presented on screen and doing justice to the role as well as portraying the image of the god was challenging for me," he says. "But thankfully, the show ran successfully for four years," adds the actor. The versatile actor is planning to perform another play Popcorn with Parsai. It would be a solo performance for two hours. The Radisson Blu, Ludhiana, is commemorating the Chinese Valentine Day during the first week of August. This week-long affair is also called the Double Seventh Festival, as it falls on the seventh day of the seventh month according to the Chinese calendar and popularly known as the Qixi festival. The legend associated with this festival dates back to the story of love between Zhinu (weaver maid) and Niulang (cow herd). The Rare Eastern Dining (RED), Radisson Blu, is hosting an extravaganza of Chinese food by coming up with delicacies that have a touch of all the Chinese provinces. So, one can savour Wasabi Sole Sui Mai with Seawood soup or Tofu clear chicken soup. "The taste-buds are undergoing a change and foodies like to taste the dish in its own goodness and not after having been immersed in pungent spices. So we have picked up the dishes from different provinces to give an altogether different look to usual Chinese food," informs Chef Dinesh. Young ladies, both vegetarian, Natasha and Tanvi, sound quite thrilled, "The vegetables with bean curd sui mui and the string beans with preserved vegetables are so different from the routine Manchurian and Chowmein stuff." For the non-vegetarians, a specialty is the pan-fried lemon grass chicken, dragon prawn spring rolls and to top it all, Sichuan Chicken Dimsum. Two corporate executives from Mumbai, Ganesh and Tripat, are more fascinated by the main course dishes, including Tai Chi Chicken and steamed fillet sole Mandarin style, "We cannot imagine such exotic food in Ludhiana," they echo. During the festival, another novelty if offered by RED and that is clients have an option to reserve a private Cabana adjoining the pool-side where their own private butler will serve the five course menu in a romantic setting! "We have found that the gourmands of this town are very adventurous, so we launched this 'first-time-ever festival', the Double Seven Valentine Special, to connect them to genuine Chinese culture," shares the general manger Rakesh Rawat. The exotic meal is well-rounded for those with a sweet tooth - the ice-cream spring rolls and a lime crème Brulle made from Caffir lime leaf and coconut milk are sure to delight you. 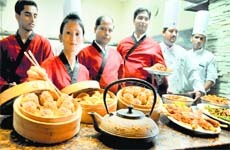 A meal for two costs Rs 2,500 plus taxes. I find people who carry off fancy stuff with aplomb and still look comfortable and presentable too as pretty stylish. Totally brand freak, though sometimes I cannot resist online offers. Sonam Kapoor would fit the bill. If given the choice you would like to be dressed by which designer? All entrepreneurs in India have something to look forward to, as businessman Robert Kiyosaki, founder of Rich Dad Company and Cashflow Technologies, is set for his maiden India visit next month to take the centre stage at the National Achievers Conference (NAC) 2014 on September 13 and 14. 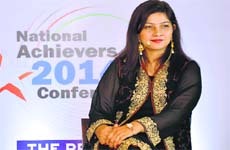 As a preview to the National Achievers Conference, a workshop for emerging entrepreneurs on Self Awakening by Sidra Jafri, author and motivational speaker, was held in Delhi recently. This interactive, communicative and experiential session enabled participants to realise the patterns in their life and change them. Sidra Jafri says, "Realising our inner strength and passion is the key to leading a happy life, be it in business (wealth creation) or social networking (expanding business) or finding peace at home; everything is linked to our key motivators or drivers, realising them is the first step." My knowledge of cinema has increased tremendously. Earlier I used to think of only acting. Now I have started thinking of every department of a film. To grow as an actor, you need to spend a longer period of time in films. Frankly speaking, though I get to play the romantic lead in films, there is no romance at all in my personal life. I am single and do not have any boyfriend. I do not mean to say that I have no male friends. If, after I am 34, I feel I should get married to a guy who I am in love with, I will certainly get married to him. I have been shooting for my films back to back. Where is the time for romance? Till March this year, I was not able to take even a day off from my hectic schedules. I am just stating this, not complaining. I am sick of telling people that though Priyanka is my didi, Meera is not my cousin at all. As she is a cousin of a cousin of a cousin of mine and we are not even close. I would say that kissing and intimate scenes are quite easy because they tend to be clinical and you have to just follow what your directors asks you to do, without feeling. I agree to do a kissing scene only if I feel that it is necessary to move the story forward, not otherwise. I do not "feel" at all while I do the kissing scenes. Kissing and crying scenes are altogether different from one another, because you have to "feel" when you do a crying scene. Ranbir to meet Katrina’s mother? Rumours are rife that Ranbir Kapoor is on his way to London to meet Katrina Kaif's mother. He will make a short trip to London in between his hectic schedule to discuss marriage with Katrina Kaif's mother. According to the grapevine, marriage is on the cards. The actor is shooting in Corsica with ex-girlfriend and actress Deepika Padukone for Imtiaz Ali's Tamasha and he might take a short break from work to make a trip to London. Ranbir is very serious about Katrina and does not want to put his relationship at risk by delaying. A source close to the couple revealed, "But now, from what we hear, Ranbir is gearing up to make that all important appearance in London to meet Katrina's parents. He has to start work on Roy almost immediately but he is still squeezing in time to make that personal and very important trip to London." Katrina Kaif has already met Ranbir's parents, Neetu and Rishi Kapoor formally in India and now it is Ranbir's turn. Ranbir has also introduced Katrina to his grandmother Krishna Raj. Furthermore, there are reports that Katrina would soon move in with Ranbir into his new furnished house. Country star Taylor Swift has sported the look of a nerdy girl with glasses and braces on a TV show. The 24-year-old singer made an audition video of herself as Natalie for a skit on The Tonight Show With Jimmy Fallon, reported a publication. "Hey Sara, it's Natalie. Remember me? Our moms were best friends in college," Swift says in the video. This August, as India celebrates its 68th year of Independence, Animal Planet takes its viewers on an exotic journey through the country. From the epic Himalayan Mountains, down the mighty River Ganges, and across less explored landscapes of the North East, it explores India's astonishing wildlife, secret locations and pristine natural beauty. To mark the occasion, Animal Planet launches Yeh Mera India animal anthem, collaborating visuals of spectacular Indian wildlife with thematic lyrics. The multi-lingual song has been composed by Bollywood's eminent music directors Salim and Sulaiman Merchant and is sung by Salim Merchant, Monali Thakur and Neeti Mohan in Hindi, Bangla and Tamil respectively. Anthem composer Salim Merchant said, "Yeh Mera India anthem epitomises the diversity and richness of fascinating regions in India. Music as a medium helps to build connect across age groups and territories. I believe the anthem would bring viewers closer to the natural world." Meanwhile, Sulaiman Merchant said, "Yeh Mera India anthem is a melodious composition to rejoice India's magnificent wildlife." Also, popular singer and actress, Monali Thakur added, "Animal Planet's Yeh Mera India puts the spotlight on different parts of India, exploring the heart, mind and soul of the country. I am excited to be a part of the celebration and rediscover my own country." Adding to her statement, Bollywood singer Neeti Mohan commented, "I love animals and I'm proud to be associated with Animal Planet. Yeh Mera India inspires viewers to live in harmony with the nature." Yeh Mera India is an immersive journey that examines the cultural, ecological, and natural heritage of this country. Follow the flow of The Ganges, from the glaciers of the world's highest mountains, the Himalayas, to the largest bay in the world, the Bay of Bengal. Find out why this river is a lifeline to an array of wild animals including India's rare one-horned rhinoceros, as well as eight percent of the world's population. Head high into the Himalayas to find out how its hostile terrain, powerful winds and sub-zero temperatures support one of the largest and most diverse collections of creatures on the planet, including man. Yeh Mera India line-up includes programmes like Wildest India, Odisha's Wetlands, Nagarahole — Tales Creatures of The Great Rains, Ladakh: Desert In The Skies, Magic Tree Of Assam, In Search Of The King Cobra amongst others. Airing every night at 8 Pm in August, Animal Planet's one-month programming line-up Yeh Mera India is a celebration of India's most stunning landscapes and incredible wildlife. When it comes to the glamour industry, there is practically a collection of tall men and actor Avinesh Rekhi is one of them. He is six feet and one inch tall, which is quite a good height to have in the television industry. Ask him about his height and he says, "In 9th standard I was selected in the basket ball team. From there on, I play regularly and it helped me to grow tall. Also, my mother is tall, so I guess I have her right genes." When asked, if he had trouble with short co-stars, he replies, "In the previous shows the actresses used to be short. But, in the current show Mein Na Bhoolugi, my co-star Aishwariya Sakuja is quite tall. I find it comfortable as she matches up to my height and I don't need to remove my footwear like I used to in previous shows." He further adds, "To get a good height, one must play lots of outdoor sports in early years. The times have changed kids are addicted to laptop, iPad and other indoor games and gadgets. Kids must be encouraged for outdoor sports." While shooting for the show, Jhalli Anjali Ke Tootey Dil Ki Amazing Story, Chandni Bhagwanani fractured her leg. As she is the lead in the show, she cannot be missing from the story, so the makers have twisted the story in a way that it shows her character with a fractured leg. With Comedy Nights with Kapil being his priority, it seems that Kapil Sharma now wants to focus on movies too. He plans to make his show once a week so that he can manage film shoots. His show recently completed 100 episodes. Rajbir Singh aka Hatim though does not shoot for his show daily as he finds it very demanding. While he performs many stunts, Rajbir is glad that audience, who appreciate his show, is noticing his work. Actor Parikshit Sahni will produce a show titled Prakriti, which will be based on father and daughter relationship and it will be telecast on Doordarshan. The show will star Nimai Bali, Amit Behl, Sheetal Maulik of Gutur Gu fame, Deepshika Nagpal and Reshmi Ghosh. Hosted by Amitabh Bachchan, quiz show, Kaun Banega Crorepati 8, made its debut in Surat, Gujarat recently. Buzz is that the show on to an international stage and the makers may shoot some episodes in the Middle East, UK, and USA too. Bipasha Basu will never work with Sajid Khan again in her life because she was extremely disturbed by the end result of Humshakals and the way he treats his cast. She has nothing against producers Vashu Bhagnani and Fox Star Studios and she had clarified on not promoting the movie before its release. Fair enough! Catch them at the college! The trailer of 3 AM, a horror film starring Rannvijay Singh and Anandita Nayar, was launched at Poddar College Festival in Central Mumbai. Take a look. The trailer got a fantastic response as the students were all over the cast. Saif Ali Khan and Kareena Kapoor Khan are celebrating his 44th birthday in London along with his close friends from there. She will not be here during the release of Singham Returns. Meanwhile, buzz has it that Saif might have to return his Padma Shri as he was involved in a brawl at a five star hotel in 2012. Filmmaker Bharat Ratan Bhushan asserts that he has directed Tamanchey, which stars Nikhil Dwivedi and Richa Chadda, but producer Suryaveer Singh Bhullar rubbishes his claim saying that the former is just trying to 'blackmail' him. We wonder who is speaking the truth! The Hundred Foot Journey, starring Om Puri and Helen Mirren, is a delightful movie and a visual treat. It is about the battle between Helen Mirren's French restaurant and Om Puri's Indian restaurant that becomes competition to them. It loses the plot during second half as too much is packed in but it has a sweet and happy ending. The performances are excellent. Most importantly, it treats the Indian characters with respect. The standees of PK will be placed near wine shops and they will be talking standees. The character is a drunkard so the promotion makes sense. People were offended by the talking standees earlier put at cinemas. The time ahead is filled with so much luck and opportunity for you that love is sure to be a huge part of the mix. If you happen to be single, your friendships are certainly a source of depth and intimacy for you to bridge the gap until your next romantic encounter. This is a year to return to your childlike spirit when it comes to love and romance. If you've been taking yourself or your love life a bit too seriously, you can rectify that situation by getting back into a playful mode. You're at your best when you live from your heart and allow your silly side to shine. After all, you're just a big kid at your core and that's exactly what others find the most attractive. Charity on birthday: Donate white clothes/school dress/white edible items to the needy. You share your birthday with Sunil Shetty (August 11, 1961, Mangalore), who made his acting debut in Balwaan, which was a moderate success. He also ventured into comedy roles in hit films such as Hera Pheri (2000), Awara Paagal Deewana, Phir Hera Pheri and De Dana Dan.